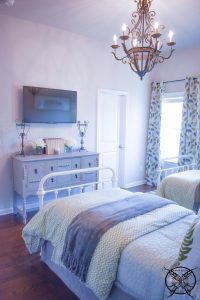 I recently decided to update our twin guest bedroom into a lush bohemian based Botanical retreat. This year I decided it was time to give one of our first decorated and designed rooms a little face lift. Believe it or not, after moving to our new home 3 year ago this was one of the first spaces I put together. One of the main reasons was because it was empty and did not have any furniture, which I am sure seems counter intuitive to some people, why not just leave it empty right? 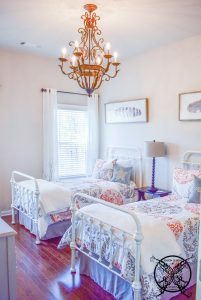 Well I know I wanted a guest room that could accommodate twin beds for some of the upcoming guests I knew we would be hosting, and I also had always wanted a set of farmhouse style iron beds. At the time it seemed less daunting than the rest of my home, that I had to figure out how to make old furniture work within. This was how it basically ended up. I ordered the Cavaillon Panel Beds, I owned the chandelier and we found the bedding on a great bed in bag sale at the time. I refinished a few pieces of project furniture that I had been meaning to get to over the years, and voila the room came together realitively easy. Now I have grown tired of the orange bedding and wanted to give the room an updated feel with reinventing the wheel. This was my inspiration board, which got me started on this project. I always recommend, when you are ready to make a change, that you go with things that you love. That is were my Pinterest boards really help me out. I love to review things that have been inspiring me, calling to me or drawing my eye. Clearly, I have decidedly had some obsession with birds, feathers, botanical and dreamcatchers, as of late. This is pointing me in the direction of bohemian or the even newer trend jungalow, a mix of jungle and bohemian. Y’all I am not sure how all this calculates in with my love of rustic farmhouse yet, but I am going to make it work, maybe “fun-galow” or “farm-galow” I do not know. All I know is the heart wants what the heart wants. So as you can see, I have added in a lot of rich green tones along with the standard farmhouse grey, which I really love. I kept the feather prints, because they really worked great in this entire theme, and ended up matching my drapes perfectly. We have layered the beds with a nice light weight quilt set, in light mint green available from Ballards. The next layer is the Reith Duvet Cover Set, which has a Utopia Hypoallergenic comforter, with corner tie tabs, which is so important with a duvet cover. Finally, the last layer is my favorite, the ultra lush the Kennebunk Bliss Plush Throw, in Grey. This side board is one of my trash to treasures that I refinished with Amy Howard chalk paint in Selznick Grey. I will never forget, I got a phone call the day before Thanksgiving that this piece was going to the curb, and if I wanted it I needed to come get it right that second. Well, my entire family was at my house. So, it became a big old family field trip, my brother, brother-in law, and oldest nephew which all assisted my husband to claim this beauty for me, while I continued to cook our holiday meal. I also think, somehow they ended up buying another turkey and deep frying it while they were there too… because they also came home with a deep fried turkey. It was a Thanksgiving adventure that I am still grateful for to this day. Some of you guys that follow me on instagram may have read my post about these encyclopedias and how I ordered them when I was five years old. Yep true story, I actually ripped an advertisement out of a Better Homes and Gardens magazine and filled out the postage paid card for this lovely set of 1980 Funk & Wagnall New World Encyclopedias. They were delivered to our door COD, I am guessing about 6 weeks later. My mother, who was completely shocked and mortified, made me explain to the truck driver how this ordering mistake had occurred. However, I do recollect that he really did not seem to care, LOL he just needed to collect his payment and to move on to his next delivery, talk about learning a life lesson early on, sheesh. Oh, and I might add this would have been my family’s second set of encyclopedias, which I had ordered because I found the color of these books to be more esthetically pleasing than the set we already owned. So, I was clearly meant to be a designer from a very easily age. Well, we are all out of time this week, but join me next time when I relive “How I accidentally set the house on fire, never leave candles unattended, but hey I got to repaint my room black” ~age 15, to be continued…. Well, I hope I didn’t scare to many of you off with the story time above, now to get back to today’s design choices. These beautiful muticolor, feather print drapery panels are from Deconovo. They are a thermal insulated blackout curtain, which are perfect for a bedroom because they prevent heat from escaping and blocks that pesky morning sunlight from entering the room. There is really nothing worse than light pouring into your room before it is time to get up, I mean seriously don’t get me started on Daylight savings time. 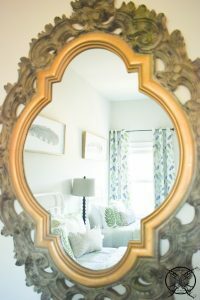 We opted to keep our original wall mirror, and now the moss colored filigree really shines with all the additional shades of green in the room. It also had a very botanical feeling as well, which proves that things just work out. I have had this piece for almost 20 years now and it looks amazing in this room, as if I had purchased it to go in this space. Our new Deconovo Handmade Monstera Leaf Embroidered Pillow Covers add just the right amount of custom elegance to the bed. It is not too over done but the eye catching pattern and quality of hand stitched pillows will not be overlooked by your guests. 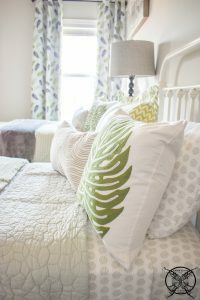 It is the touches like this that can elevate any space to make it feel more custom, and I have to say at $14.99 for a set of two, these pillows are such a wonderful quality and your guest will never know you got such a deal with the hand stitch details. They really are very reminiscent of things I have seen for quadruple the price at Anthropologie. Between the beds, we have a luxurious white Faux Sheepskin Shag Rectangle Runner, in a 2’x3’size. This creates a nice warm soft place for your feet to land in the mornings when you wake. 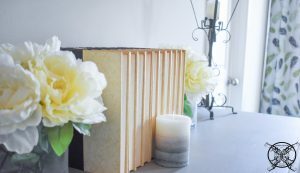 I have found that while I love having hardwood floors throughout my home, little touches like this help, especially during the winter months to make your guests feel more comfortable. We also added the Mara Crewl Pillow from Ballard’s to the bed, just to bring a touch more grey to the party, they pair very nicely with the Kennebunk Bliss Plush Throw that I picked up from Nordstroms on the anniversary sale. I decided after looking at the space for about a week, that it needed a piece of framed art on the empty space between the drapes. It was just a big empty hole and my eyes kept landing there eveytime I would enter the room. All I can say is trust your instincts, if you eye lands there and it needs something chances are your gut is not wrong. I actually already owned this piece of pressed paper art that I picked up last year at the SugarBoo warehouse sale. I did not know exactly where it was going to go, until now. 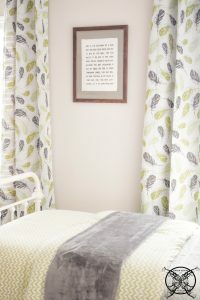 The quote seemed like an inspirational way to start your day, so therefore perfect for a for guest bedroom. 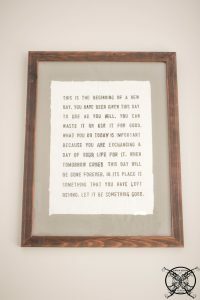 I also already had this great rustic frame too, that I snagged at a Hobby Lobby 80% off sale for $4.99. So, all I needed was a matte board to mount the pressed paper to, and voila, Insta-Art. All in all, I am pleased with the new botanical boho look we have in this room. I find it be more soothing and pleasing to eye and probably more restful and relaxing for our guests as well. I guess I will just have to ask the next lucky set of over night visitors that get to try out all the new stuff, what they think about the new digs. 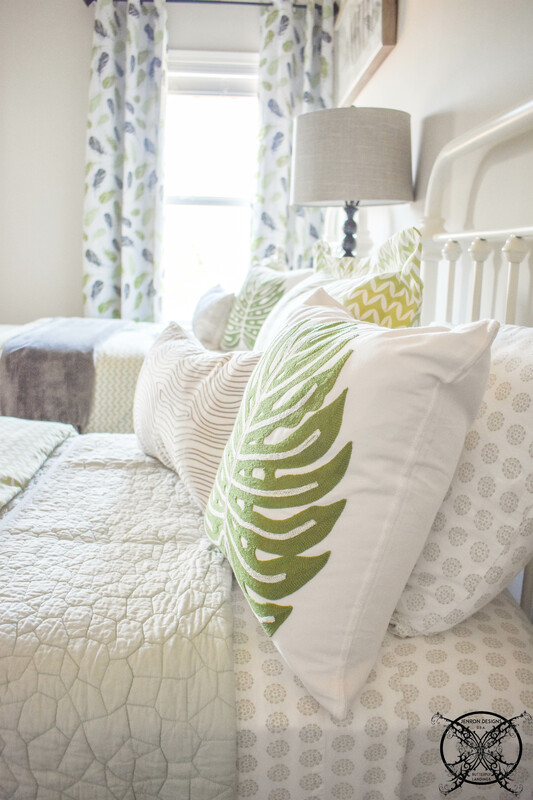 You definitely made the bedroom so cozy and beautiful perfect for any guests. So many pretty things in this room so hard to pick just one thing as my favorite, I like it all. Such a gorgeous space your guest are so lucky to have such nice hosts. This is a lovely bedroom the colors are very inviting and peaceful for your guests. I really appreciate the the layers of bedding and textures of your textiles they make those beds seems very luxurious. I love green so this room would be in my crayon box for sure. This is really fascinating and you are a very professional blogger. I’ve joined youг feed and signed up for more of your great posts. Also, I’ve shared your site in my socіal netwoгks! A motivating decorating for the spring, love these patterns, Best wishes!! Hello, you have done a fantastic job. I’ll certainly do love it and personally recommend to my friends. I am confident theү will bе benefit from this website too. 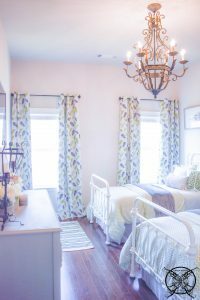 Just an amazing post such a pretty room and great color scheme. The flowers are fresh and brilliant. Can you tell us morе about this room? I’d like to find out some additional information on the bedding. This room is beautiful Jen, I love all the pretty greens you added to the space. It really makes it feel fresh and alive. Pleased to find your lovely site and see all the beautiful things that your do. I really like the color and patterns you have selected for this room that adda very tranquil feeling. I could easily see this for my own bedroom. 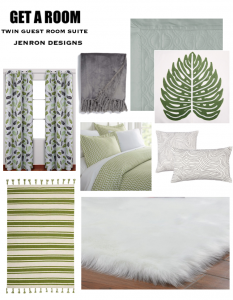 A motivating room upgrade for certain, love all this botanical touches of feathers and leaves. Best wishes!! I am so motivated to update my bedroom now love this lush creation of botanicals you created. Jen I love this room, and the colors you added so peaceful. What a beautiful area and love the framed art from Sugarboo, love that you featured it sweet friend. I love this space, and the idea of creating a bohemian farmhouse feel is very cool, LOVE IT! Exploring different design ideas is so much fun I love the farm-galow idea or farm-hamia concept, it is in there girl well will get it figured out. Exploring design information through testimonials is some of the best way to get information for creating a space. Bohemian is so on point right now, and I love how you are working it into your rustic southern style. Your guest room is so bright and airy I love the twin metal beds and the simplicity of this space. Nice job. I just ⅼove looking through your posts and this one did not disappoint what a great chandelier too! I love looking through your blog and all your inspirations, this room is really beautiful. Such a pretty bedroom love all those colors and those pillows are perfect they do look just like an Anthropologie product. 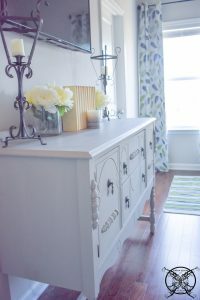 Love this room and the fresh vibe you have created, I am so ready for spring and the delights that come with it. What a great eye for detail and taste for delineation, you may make an environment impeccable for virtually any exercises associated with feasting room. I love green it is one of my favorite colors so I am happy to see it is heavy use this year. 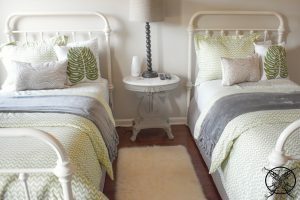 Such a pretty space, I love the color and that amazing bedding on the twin beds. I have always wanted to have a space with twin beds they seem so functional. Trust your instincts because this room is beautiful, great job! Gorgeous room my friend you always do such a great job. 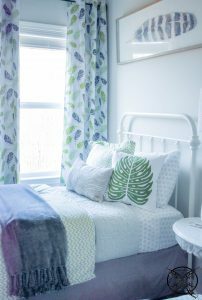 Loving this room Jen, it is so fresh and vibrant all decked out for spring. I love how chic and elegant this room looks. The lighting fixture and mirror really caught my eye. I definitely got some inspiration for my bedroom! Juѕt wished to say your article iѕ as astounding and design is flawless. It’s amazing you changed up this room you have a fantastic makeover. Great job! Oh how beautiful, light, airy, and relaxing! I just love this room. Yes ma’am I think you may have cracked one of my codes of design, which is, you want to carry ideas and inspirations of things you love through out your home. If you love something you will always be drawn to it whether it be a collection of items, a specific color, or type of pattern. 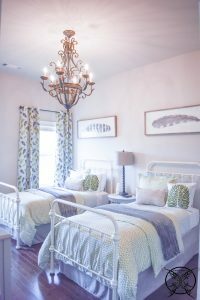 While trends may come and go you will always be drawn to love what you love, so you should embrace that side of your character and add to your home, to create a sense of you. That is what truly makes “a house, a home”, and breaks down the sterile, impersonal museum vibe that can leave people feeling like your “house” is constantly staged and not actually lived in, and there is a huge difference between a clean home and a sterile home. I actually loving this decor! Minimalist is so in right now and although I love the minimalist decor as well, this is so refreshing to see. The pop of color isn’t too much and this is great especially for those who lives in a non tropical weather who is experiencing so much snow right now (like me!) as it feels like you’re just somewhere warm! When it comes to decorating I’m no good. This looks amazing and definitely something I could possibly do! The room was beautiful before and even more so afterwards! I love the color scheme you chose and the inspiration board was such a great idea! I’m ready to redecorate! 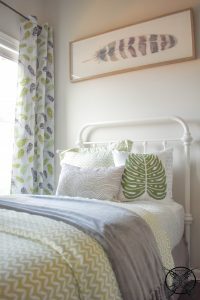 Oh my gosh I love those pillows and that the drapes match your framed art, because those feathers are so fun. I notice that when you get an idea you integrate in all parts of your life, the birds for Halloween, then the bathroom now feathers and I think you had dreamcatchers on your holiday tree? I now can see how your inspiration works, and I love it you just carry an idea forward. Love this! Can we call it “bunghouse” for fun though? 😂 I love how layering lets us add so much demention and tie in different themes such as the bungalow andfarm house deal. I love the upgrade you gave your guest bedroom. I love the botanical theme. The curtains and pillows are by far my favorite. I am wanting to do my living room with that kind of theme. This post has given me some more ideas. Wow. You have a creative touch! Thank you so much Suzy! I really do appreciate it, and you unwavering support you always make my day a little brighter! I have some really fun stuff on the way that I have have been working on too, that I am so excited to share with everyone. I have really enjoyed getting back to designing more,LOL, “less computer stuff…. more design” was my resolution this year so I hope you enjoy it as much as I am. Jen this is beautiful I really find this room more soothing from the previous orange, but that is just me. Great job, Love everything! I absolutely love your site and get so many ideas every time I visit, you have so much talent. I love all the greens you added to this space, it really does feel very fresh and spring like. I also love those pillows they really do look like a Anthro pillow, good call, going to buy a set or two for the porch. This design is stellar! You obviously know how to keep your readers entertained. Excellent job. As always love your designs. Keep sharing your very inspiring! This room is so pretty my friend so now I can come for visit? YES!